Do you have a question about Cozmix? Perhaps the answer can be found below. Do I have to make a reservation if I want to come watching a planetarium show? Do you provide a full day program for groups? Can you visit with a group in the evening hours? 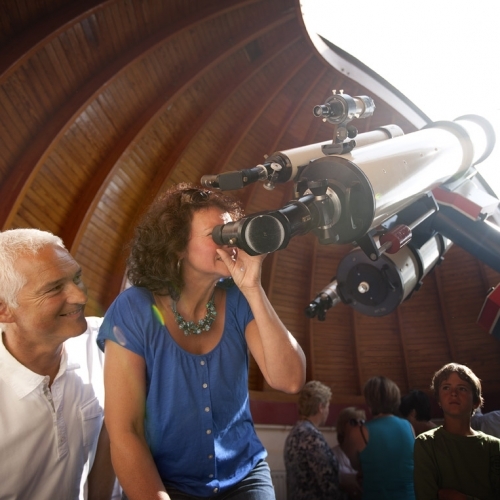 No, a reservation is not necessary for individual or family visits during our fixed planetarium hours. Only for group visits with more than 15 persons a reservation is necessary. Please make sure to be present in the visitor centre before the indicated time. Once the show is started, it is not possible to access the projection dome anymore. Cozmix is open for individual visitors on Wednesday afternoons, Friday evenings and Sunday afternoons. During school holidays also on Monday, Tuesday and Thursday afternoons. Every visit to Cozmix is a total experience where a guide accompanies you, from the indicated times. Groups can make a reservation during daytime or evening also outside of the fixed show hours. Normally a guided visit including planetarium show and explanations in the interactive exposition and telescopes takes approximately 2 hours, depending on questions and interaction. It is however possible to organise a full day program with different activities. Please contact Cozmix directly for more information. A visit to Cozmix can also be combined with a visit to the wildlife centre in the same building. The wildlife centre also presents an interactive exposition about flora and fauna in the forest. More information can be found here. Yes, groups can always make a reservation and are always welcomed – also during the evening or in the weekend. A guide accompanies the group. Please see here for more information.